Brief Synopsis – Two bounty hunters on their way to collect fees for bringing in outlaws get stranded by an impending blizzard in a local inn with a few strangers who may or may not be who they say they are. My Take on it – Even since I saw Reservoir Dogs (1992) about 23 years ago, I have been a big fan of Quentin Tarantino’s movies. Not only is he an expert Director, but he knows how to write stories that are so engaging that you feel so connected to the characters and their stories. His dialogue is always superb and this movie’s dialogue is no exception. How does he do that so perfectly???? The majority of this nearly 3 hour epic is characters conversing and you never wanna miss any of it because it’s done so well. The time goes by so smoothly that you forget that you just spent nearly 3 hours back in the old west because you’re having so much fun along the way. 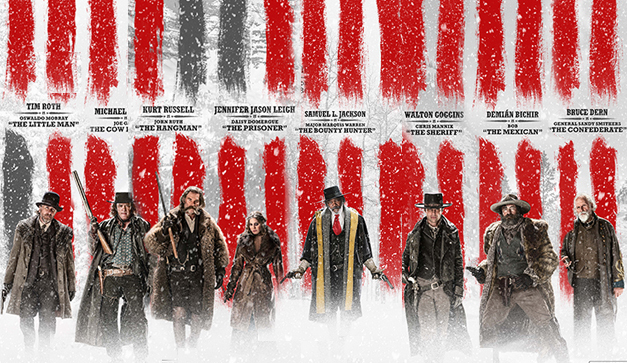 Tarantino has a tendency in his movies to include extreme violence and language and this movie is no exception. Once again, the amounts used feel justified for this kind of movie. The cast is superb as always. He uses many alumni from his previous movies with very few new faces around, but even the alumni feel fresh and each were perfectly chosen. This is such a great addition to his directorial resume. I can’t wait to see this one again! Bottom Line – QT once again at his best. The script is excellent, the characters are interesting and the dialogue is WOW!! It’s nearly 3 hours long, but you don’t feel it because you are just having so much fun along the way. QT has a tendency to go over the top with violence and language, but even the amounts used here are perfect. I’m always curious as to how he is able to write such crisp and engaging dialogue. Excellent class of QT alumni still makes it great despite not bringing in too many new faces for this one. Highly Recommended! Loved it. Goggins and Leigh in particular were phenomenal, and such an expert balance of comedy, tension, and suspense. And of course, when all hell breaks loose, it’s wildly entertaining. This is the kind of movie I’d recommend to someone if they wanted to know why I love movies. Definitely – a film made by a lover of film for lovers of film. Very strong review, I do love a bit of Tarantino. His movies always have something enjoyable about them from outrageous bombast to killer soundtrack. His movies know how to get your attention. I love all his references to other genres, it’s really good picking up on them. I’ll be sure to let you know what I make of this movie. Also, I’ve started a trivia feature on my blog, hope you enjoy.